We hope you enjoyed a wonderful weekend! This week we are kicking off Construction Week by sharing four easy construction activities for kids! Our Weekly Virtual Book Club for Kids featured book this week is Goodnight, Goodnight Construction Site by Sherri Duskey. We LOVE it and had so much fun reading it and then wrangling together all of our favorite construction trucks and materials so that we could share these activities with you! We created FOUR construction activities to share with you, and you can find TWO of the activities here and TWO MORE easy construction activities over on the Melissa and Doug Blog. Materials Needed: Dried beans, Dried barley or rice, pebbles, Round the Construction Zone Work Site Rug & Vehicle Set from Melissa & Doug, small plastic lids and containers. Playing with our construction trucks and sensory materials is always so much fun. To set up our sensory play activity we rolled out our Construction zone work site rug and gathered our vehicles. We added a few other vehicles in addition to the roller, cement truck, and dump truck that were included. We also used some of the haulers from our wooden construction site vehicles set. Once we gathered our materials we set up different areas around the mat for the sensory building materials (barley/beans/rocks, etc). We also add plastic lids and containers around the mat for dumping. I didn't give the kids any specific instructions other than to try their hardest to keep most of the materials on the playmat. The kids had so much fun driving the trucks around, picking up loads, dumping sensory materials, and even building with them! They also got to use their diggers and haulers to clean up sensory materials when there were any spills at the construction site! It was fun to see the kids working together and this activity also provided several opportunities for conflict resolution practice! The kids were SO EXCITED about the materials, play mat, and trucks that sometimes it was hard to share, take turns, and work together. I joined in the play for a little bit to help model appropriate turn taking and conflict resolution skills and it was neat to watch as the kids got better at working out any problems as they played. My favorite creation was my son's huge long sidewalk made out of pebbles! Adding some simple sensory materials to our work site rug was a lot of fun. The mat is made of durable rug material and is stain-resistant and machine-washable. It is also has skid-proof backing that is safe on all floor surfaces so it didn't move around while we played! Materials Needed: Reusable Vehicle Sticker Pad, markers, paper tape, scissors, and a window. We love reusable stickers! We found this awesome Reusable Vehicle Sticker Pad and ripped out the construction themed set for Construction week! Once we ripped out the construction pages we stuck all of the construction vehicle stickers onto my sliding glass door for a little sorting project! We took some paper tape, cut it up., and wrote the different names of construction vehicles on each piece of paper tape. Next we stuck the paper tape on the sliding glass window and then tried to match the names of the construction vehicles to the correct vehicle. This was hard, but informative! We even had to do an online search once or twice just to make sure we got the vehicles matched properly! Reusable stickers work great on sliding glass doors and glass windows! After we were done matching the vehicles we talked about their names and then the kids just enjoyed playing with the construction vehicles and the play scene on the window. As an extension activity you could also give your kids some whiteboard markers and have them draw their own construction scene on the window for them to use with their reusable stickers! 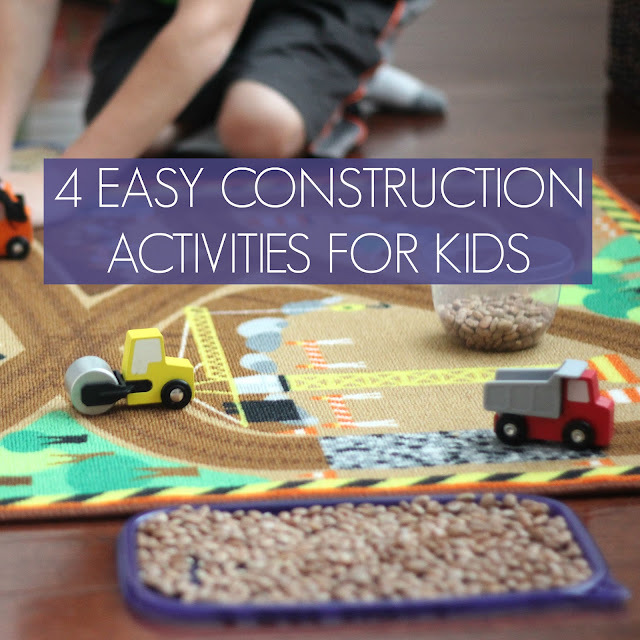 These simple construction themed activities can be done over and over again. NOW HEAD ON OVER TO THE MELISSA AND DOUG BLOG TO CHECK OUT 2 MORE CONSTRUCTION ACTIVITIES FOR KIDS. This week our Virtual Book Club for Kids co-hosts have also been creating construction themed activities to share with you! Click on the links below to see what they shared! Disclosure: I am a paid guest blogger over at the Melissa & Doug Blog and received these Melissa & Doug products for free to use as part of our Construction posts. All opinions are mine.